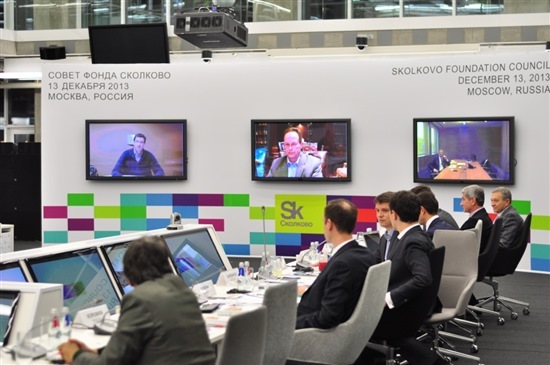 The annual meeting of the Skolkovo Foundation Council took place on December 13, 2013 at the Skolkovo Innovation Center. 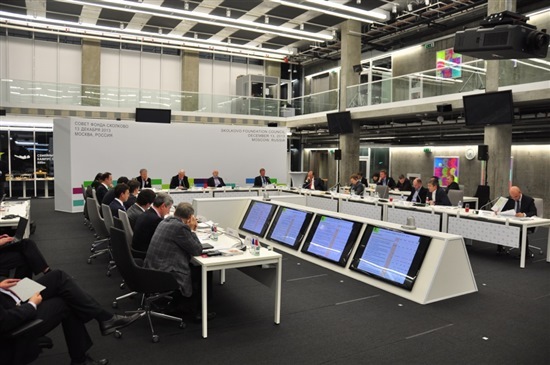 The Council approved the budget of the organization for the period 2014-2016, KPIs for the Skolkovo management team for the period until 2018. Besides, the Skolkovo Foundation Council gave consideration to a new communications strategy and confirmed changes in structure of Skolkovo employees’ salaries and bonuses. Number of other, crucially important for the entire Skolkovo eco-system issues, were also discussed at the Council’s meeting. The meeting started with the welcoming speeches and opening remarks of the Skolkovo Foundation President, co-chairman of the Skolkovo Foundation Council, Viktor Vekselberg and co-chairman of the Skolkovo Foundation Council, retired CEO/Chairman of Intel Corporation Craig Barrett. In his speech Viktor Vekselberg told the Council members about the recent Supervisory Board meeting, chaired by the Russian prime-minister Dmitry Medvedev. Number of key ministers of the governmental economy block also took part in that meeting. Viktor Vekselberg also said to the Council members the year 2013 wasn’t an easy one for the Foundation: the organization needs to significantly intensify its activities to enhance development of the Russian system of technological innovations. And this for changes had a profound impact on decisions, taken by the Foundation Council, particularly in such spheres, as compensations policy of Skolkovo’s top management, new system of key performance indicators for the entire organization, issue of further enhancing of the construction activities at the Innovation City, some others. One of the issues, actively discussed by the members of the Skolkovo Foundation Council, was new external communications strategy, presented by Skolkovo’s VP Alexander Chernov. He reminded the Council members that at the previous meeting the Council requested to intensify activities in this direction. The Council asked to develop an integrated communications concept, a comprehensive and consistent strategy of information and advertising activities. This communication strategy should be in line with highest world standards on one hand, and should reflect specifics of the Skolkovo project on another. People, innovators, scientists, start-uppers, Skoltech students should be the main target, focus group of the new concept. «People in focus, rather than just infrastructure, and clear numerical indicators (of effectiveness)», stressed Alexander Chernov, characterizing the essence of the new concept. These new directions have set new goals, aimed to significant changes in communications performance indicators, particularly when it comes to digital communications, activities in the internet. The Foundation wants to significantly increase, at least to double, the Skolkovo’s website traffic among other. Intensification process will also affect some other important aspects of advertising, information and public relations activities. 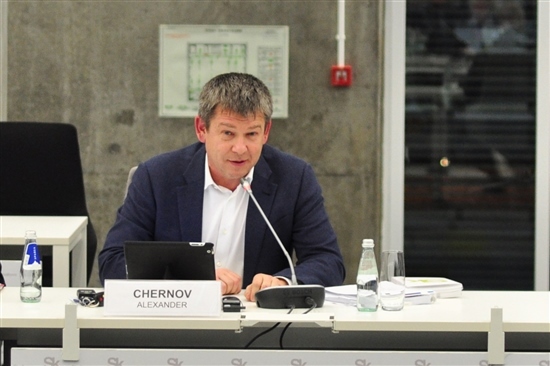 Co-branding programs in cooperation with Skolkovo’s key partners could be an interesting and highly promising instrument to be applied soon in the Foundation’s advertising strategy, Chernov said. During his presentation Alexander Chernov demonstrated to the Council’s members some graphic and conceptual components of the future program. Several members of the Skolkovo Foundation Council expressed their intention to participate in further elaboration of the concept. A number of foreign members of the Foundation, such as Eric Schmidt (Google), John Chambers (Cisco Systems) attended the meeting remotely, discussing the issues from California, with the help of state-of-the-art telepresence system, which was established in the Hypercube building by one of Skolkovo’s key partners. The Skolkovo Foundation Council welcomed its new members, among them Suresh Prabhu, chairperson of the Indian Council on Energy, Environment and Water; Vladimir Artyakov, deputy general director of Rostec State Corporation (also known as Rostechnolgii or Russian Technologies) and Dmitry Pumpyansky, chairman of the board of directors of the Tube Metallurgical Company. The Skolkovo Foundation Council expressed gratitude for cooperation for those excluded from its members Vagit Alekperov (LUKOIL) and Ratan Tata (Tata Sons corporation), among them. The following top managers of the Skolkovo Foundation made their presentations on issues related to current execution of the KPI, changes in managerial team, on cooperation with Skolkovo’s key partners, as well as other operational issues: Andrei Burenin, chairman of the board of the Skolkovo Foundation (main speaker); Vasily Belov, senior VP on innovations: Gregory Burenkov, senior VP on economy and finance; Anton Yakovenko, ODAS, Skolkovo’s construction unit general director. Andrei Ivanov, deputy finance minister took an active part in the meeting.